Diabetes was recognized as far back as 1500 BC by Egyptian scientists. In 600 BC scientists later noted that ants seemed to be particularly drawn to the urine of people with diabetes. The earliest documented diagnosis of the disease was during the middle ages when Chinese, Indian and Egyptian scientists tested the urine of people thought to have diabetes by tasting it for a sweet distinctive taste. The first clinical exam for diabetes was performed by a doctor named Karl Tommer in 1841 who tested urine with acid hydrolysis which broke up the disaccharides into monosaccharides and then after the addition of other chemicals results in a reaction forming if sugar is present. In 1850 Hermann von Fehling was able to expand on Trommer’s work to quantify the results. Later in the 19th century, Frederick Pavy developed tablets that when added to the urine would show if there was glucose in the urine. In 1907 Stanley Benedict was able to refine Fehling’s test. In 1913 Ivar Bang discovered a way to test the blood for glucose. In the 1940’s urine test strips were developed that would change colors depending on the amount of glucose was in the urine. In more modern times, test strips were introduced in 1964 that could check the blood for sugar and the first glucometer that was able to test blood samples for elevated sugar was developed in 1970. 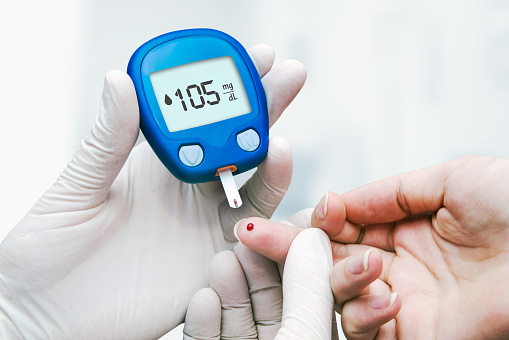 Another test for diabetes was developed in the mid 1970’s and it tested for hemoglobin A1c. Glucose testing has now progressed to the point where blood sugar can be determined by a sensor that can measure it through the skin, with no need to take a drop of blood.